Dr. Blum’s INNOVATIVE TWO-WEEK PLAN to quickly reduce pain through anti-inflammatory foods and supplements; followed by an intensive gut repair to rid the body of bad bacteria and strengthen the gastrointestinal system for a dramatic improvement in arthritis symptoms and inflammation; and then addresses the emotional issues that contribute to inflammation, and eating a simple, Mediterranean inspired diet to maintain a healthy gut. 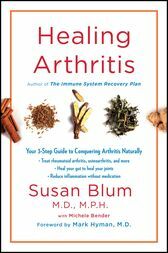 Susan Blum, MD, MPH, is the founder of the Blum Center for Health in Rye Brook, New York, an advisor to the Institute for Functional Medicine, and serves on the Medical Advisory Board for The Dr. Oz Show. An assistant clinical professor in the Department of Preventive Medicine at the Mount Sinai School of Medicine, she has been treating and preventing chronic disease for more than a decade. She lives in Armonk, New York, with her husband and three sons. Michele Bender is an award-winning freelance writer who has coauthored bestselling books such as Believe Me with Yolanda Hadid, The Immune System Recovery Plan with Dr. Susan Blum and Curly Girl: The Handbook. Her work has also appeared in The New York Times, Glamour, Real Simple, and Family Circle, among other national publications.